In just two decades, 200 lakes in Ruo’ergai County have dried up due to desertification, and Shitso Lake, once home to a large and rich variety of biodiversity, is disappearing. Ruo’ergai is where the Yellow River and Rmechu River meet, local people refer to it as “the kidneys of the Yellow River” because its plateau wetlands are the water source of 30 percent of the Yellow River. What was once green pasture is now sand. Ruo’ergai (Dzorge in Tibetan), in China’s Sichuan Province, Aba Prefecture, is known as a “water tower” of China. However, villagers can see the desert creeping up on them, and with the rate of desertification increasing by approximately 8 percent annually, community members from Tsheshul Village expressed fear that in only a few short years their village would be swallowed up by sand. This fear, coupled with unsuccessful programs in the past to reverse the desertification, left local people feeling hopeless to do anything about it. The USAID-funded TSERING program, implemented by Winrock International, responded to this urgent need in the spring of 2010 with anti-desertification training and activities (fencing, planting grass seeds and trees, and fertilizing) in cooperation with the Ruo’ergai Forestry Bureau and TSERING partner Sichuan Grassland Research Institute (LOMAN). Working together with local communities and government, in just a few months, the TSERING project changed 800 Mu of desert back into grassland and provided a successful example for communities to replicate that will allow them to reverse the desertification trend. 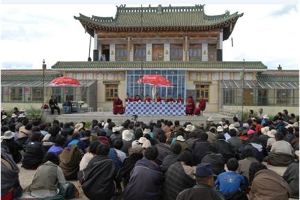 To achieve this success, TSERING staff worked closely with villagers to ensure that they had greater ownership of the rehabilitation project. They received training on analyzing the reasons for desertification and developing solutions. Villagers responded enthusiastically and told program staff that they now have more control over their circumstances and can take action to stop the desertification of their land. Because of the community-felt ownership, Tsheshul villagers from all walks of life volunteered to help with the rehabilitation — from a 4-year-old boy to an 80-year-old grandmother.